Getting people online is a big part of what the Aotearoa People's Network Kaharoa is all about, but we're also interested in getting people sharing their local stories and the history of their communities in that online space. Cyber Security Awareness Week may have a rather imposing name with all those capital letters but really, it's all about encouraging people to take the caution and commonsense they'd use in the physical world and apply it in an online context. Online safety organisation, Netsafe has produced a series of short, funny videos highlighting some simple ways that digital citizens can increase their cyber-security. 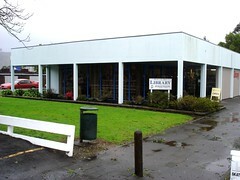 Mercury Bay Library is situated in the pleasant coastal town of Whitianga in the Thames-Coromandel district. It's not a large facility but offers all the services and activities you'd expect from a modern library. It has its own Facebook page and offers an ebook service. It has APNK PCs for library visitors to use and we're happy to say that, it now has free Wi-Fi... again. Does no library building mean no library internet? What happens when a community is suddenly without its library, and what can be done to maintain basic services? Those of you who read our monthly newsletter may already be aware that our Asset Refresh Project is about to kick off. But what is an "Asset Refresh" and why are we doing it? Well, one of the ideas behind the ongoing partnership we have with public libraries is that it's not just about installing equipment and an Internet connection, it's about providing a good service to the end user with functional, up-to-date equipment. Periodically we have anxious library staff call our helpdesk concerned that the APNK computer they're looking at may have been "infected" with a computer virus. Because of the systems and security that we have in place it's fairly unlikely that this could happen to one of the machines on our network, even though from a customer's or library staff member's point of view it may look very much like this is what's happening. What often turns out to be the culprit is a malicious website which is designed to look exactly like a Windows systems folder. What does it mean to be a staff member working in a library that offers free APNK Internet? How does this change the nature of your customer interactions, or indeed who your customers are? How can we let staff at APNK libraries from all over the country talk to each other about these things? One of the things we often wonder, from APNK HQ in Christchurch, is what kinds of things people are using our free computing service for? What information are they discovering? What content are they creating? Sometimes we don't have to wonder because a customer is so happy with what they've been able to do using APNK that they get in touch and tell us about it. One such customer is budding writer, Andy Hatton. We're sad to say that Mark Lawrence, APNK's erstwhile Technical Architect, will be leaving the team at the end of this week.